All hunters are required to obtain a Wildlife Identification Number (WIN) card which includes filling our an application form and small fee. There are available at many sporting goods stores, convenient stores and some gas stations through-out the Peace Country. 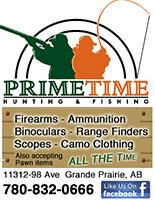 Grande Prairie: Canadian Tire Store, both IGA stores, and Primetime Hunting. Girouxille: General Co-op, Main Street. ALBERTA (The Peace Country Area) HUNTING ZONE: BOREAL Region. 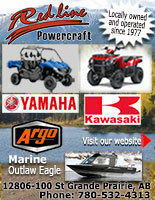 The Hunting area in the Grande Prairie and Peace River area is known as the Boreal Region. Big Game Animals include: the Black Bear, Grizzly Bear, Moose, Elk, Mule Deer, White-tailed Deer, Cougar and Coyote. Game Birds include: The Spruce Grouse, Ruffed Grouse, Sharp-tailed Grouse, Gray Partridge, the Pheasant and Ptarmigan. Waterfowl include: Mallard Ducks, the Canada Goose, Ross' Goose, White-fronted Goose, and Snow Goose. The Boreal Region has millions of acres of public land but hunters are reminded that to gain access to privately owned land or leased land, permission must be acquired before hunting. All hunters are required to follow the Alberta Hunting Regulations. You can be 12 years old to possess a hunting license in Alberta but anyone under the age of 18 must be accompanied by a parent or have written permission of such person. The Northeastern part of British Columbia is known as the Peace Zone 7B. Hunting for Elk and Caribou is popular. Other species hunted in this zone are Mule Deer, White-tailed Deer, Moose, Bighorn Mountain Sheep, Thinhorn Mountain Sheep, Mountain Goat, Caribou, Black Bear, Wolf, Cougar, Coyote, Wolverine, Lynx, Snowshoe Hare, Blue Grouse, Spruce and Ruffed Grouse, Sharp-Tailed Grouse, Ptarmigan, Raven, Coots, Common Snipe, Ducks, White-Fronted, Snow, Ross's, Canada and Cackling Geese. Even though registration of firearms was cancelled in 2012, you still need to have a Possession and Acquisition License. You cannot purchase a firearm or ammunition without one. The Possession Only License is valid for five years. You can own your current rifle but cannot purchase any more firearms unless you have the Possession and Acquisition License. More information available from www.rcmp-grc.gc.ca/cfp Phone 1-800-731-4000.